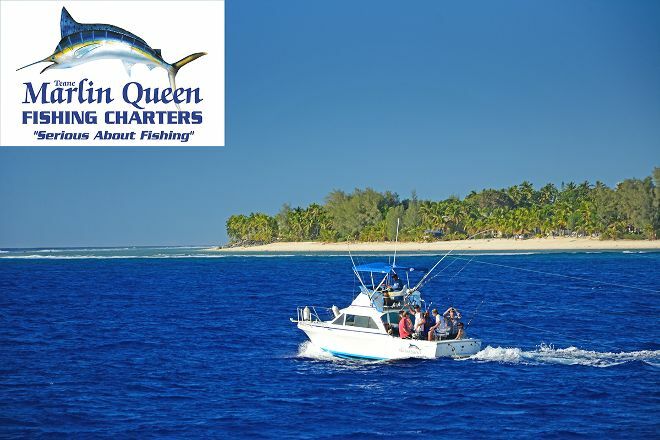 If you're serious about big game fishing, go with Marlin Queen Fishing Charters, offering shared and private charters for both half- and full-day trips. The operator specializes in fishing holidays, with accommodation and transport packages tailor made to suit group or individual needs and requirements. All charters include soft drinks, water, and light refreshments, available throughout the day. You can also BYOB--and keep it on ice while onboard. For groups of more than 8 anglers, the operator can organize an inter-boat competition, with prizes and trophies for the winners. Check the website for more details, and email the operator directly for all quote enquires and availability info. Make Marlin Queen Fishing Charters a part of your Rarotonga vacation plans using our Rarotonga online day trip planner . A great fishing charter with friendly staff. Our charter brought in a 247 kg marlin with nearly a 3 hour fight time from hook up to in the boat. Was a fun afternoon. We had a terrible experience with this company. My husband went out fishing with them this Tuesday. They called the hotel we were staying at and informed me that he had not arrived and that they went on the tour without him after waiting an hour for him. As my husband had left the hotel 4 hours before this call, I was very worried that something had happened to him. He was gone all day and I called the police to let them know my husband had gone missing. They started a missing person search. I called the hospital to check if he was there. The hotel staff were very worried and helped me try to locate him. After a whole day of worrying, the marlin queen called to say that they made a mistake and he actually was on the boat. They laughed about their incompetence and told me he caught a fish. They ruined an entire day of my holidays while I was at the hotel with my 5 month old baby worrying her daddy was in trouble. They did nothing to compensate for their mistake and laughed at me on the phone. I would be very concerned with going with a fishing charter that can’t keep track of 2 people. On the boat, there was just my husband and another man. The driver of the boat smoked the entire time, drove with his foot and did not make conversation. He also did not care when both his passengers were terribly sea sick. He did not let them set the hook or land their own fish. Essentially, we paid a lot of money for my husband to reel in one fish. I would recommend going with one of the many other companies out there. Wow. The most amazing fishing charter! Great staff, fun day and LOTSA fish!! Thanks so much Marlin Queen Fishing Charters we will be back to see you as soon as we can!!!! Every day, we help thousands of travelers plan great vacations. Here are some tips on how to use your Listing Page to attract more travelers to your business - Marlin Queen Fishing Charters. Promote your permanent link - https://www.inspirock.com/cook-islands/rarotonga/marlin-queen-fishing-charters-a282774375 - on your website, your blog, and social media. When a traveler builds a plan from this page, the itinerary automatically includes Marlin Queen Fishing Charters. This is a great way for travelers looking for a great vacation in your city or country to also experience Marlin Queen Fishing Charters. Promoting your link also lets your audience know that you are featured on a rapidly growing travel site. In addition, the more this page is used, the more we will promote Marlin Queen Fishing Charters to other Inspirock users. For best results, use the customized Trip Planning Widget for Marlin Queen Fishing Charters on your website. It has all the advantages mentioned above, plus users to your site can conveniently access it directly on your site. Visitors to your site will appreciate you offering them help with planning their vacation. Setting this up takes just a few minutes - Click here for instructions.